Australian Jay McCarthy (Tinkoff) has claimed victory on Stage 2 of the 2016 Tour Down Under and the leaders’ jersey on an uphill sprint into Stirling after a crash marred the final kilometre. For a majority of the day, it was a lone wolf out in front of the peloton as Adam Hansen held the lead of the race. Interestingly though, he was never allowed more than about two minutes off the front and Orica GreenEdge worked hard to keep him in touching distance. Adam Hansen only got away from the peloton after a four rider breakaway, featuring Thomas De Gendt was allowed to go and take the King of the Mountains points for the day. However, they were swiftly caught and Hansen would go on the attack around 90 kilometres from the finish line. After going through both intermediate sprints with a lead of just over 2 minutes, the lead would come down to under a minute as Orica realised they may not want Hansen off the front. However the peloton would ease up again and the lead for Hansen would fluctuate between 1:30 and 2 minutes for quite a time. Without about 30 kilometres to go, the stage changed dynamic and BMC Racing hit the front with Rohan Dennis and Richie Porte to look after. The pace they would set would see Hansen’s lead be dramatically reduced and with just 19 kilometres to go he would be caught. From there, it was a flurry of activity at the front of the peloton as teams came and went, trying to put their own team leaders in good positions. Coming into the last kilometre, after Team Sky had put in a huge burst and disappeared, Tinkoff, Cannondale and Lampre were the three teams to lead onto the final uphill stretch. With around 700 metres to go though, a crash saw a number of riders hit the deck. Among them were Simon Gerrans (Orica), Richie Porte (BMC) and Geraint Thomas (Sky). Tinkoff would be the beneficiaries with plenty of numbers on the front of the peloton. Coming into the final couple of hundred metres, Jay McCarthy would hit out a long way from home, with Diego Ulissi coming around on his right at the end, but unable to go over the top. 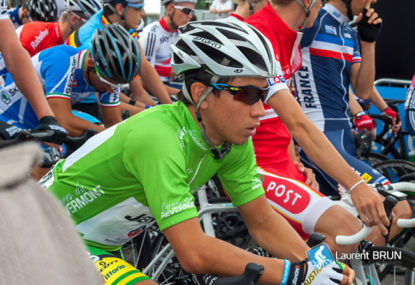 Can anyone stop Caleb Ewan on Stage 2 of the 2016 Tour Down Under from Unley to Stirling over a distance of 132km? It seems unlikely at the end of a very hilly day. Join The Roar for live coverage from 12:30pm (AEDT). Stage 2 is a lot more challenging than yesterday’s stage, which was taken out by Ewan (Orica-GreenEDGE) in a perfect sprinting performance. The win landed him the overall race lead, ahead of Mark Renshaw (Dimension) and Alexis Gougeard (AG2R). Today, it won’t take the riders long to get onto the first and only categorised climb of the day. The Category 2 Range View Road should see a ferocious pace early on, as the opportunists in the peloton battle for the King of the Mountains points on offer. From there, the race rolls onto a circuit, of which the peloton will complete five laps. The undulating circuit is just over 20 kilometres in length, and the smartest teams and riders should benefit. There are two intermediate sprint points today, both coming in Heathfield, after 27.9 and 49.3 kilometres. The finale of the stage is relatively flat, with the last two kilometres or so up a false flat. Therefore timing the sprint will be crucial, as will having teammates at the pointy end for a lead out. Ewan obviously goes in as the favourite, although it will be interesting to see if Mark Renshaw can again be a factor. Three riders who finished in the top ten from Stage 1 – Ben Swift (Sky), Steele Van Hoff (Uni SA) and Giacomo Nizzolo (Trek) – could all use the course’s hilly nature to their advantage as well. The weather conditions are again expected to be hot and windy, adding another massive element to the race. It’s a hilly day for the most part, with a slight uphill kink in the finish set to challenge Renshaw. Hard to go past Ewan, although with the weather conditions, a breakaway or reduced peloton could come to the line first. Be sure to join The Roar for live coverage of Stage 2 in the 2016 Tour Down Under from 12:30pm (AEDT), and don’t forget to add your own comments in the section below.